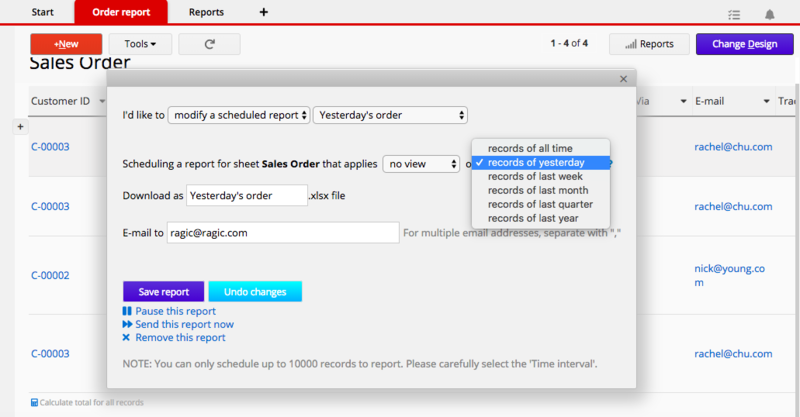 In cases where you need to automatically E-mail reports of the records in a particular sheet within a regular time interval (e. g. to keeping track of your company’s weekly/ monthly/ yearly sales), Schedule Report can be a very useful tool. 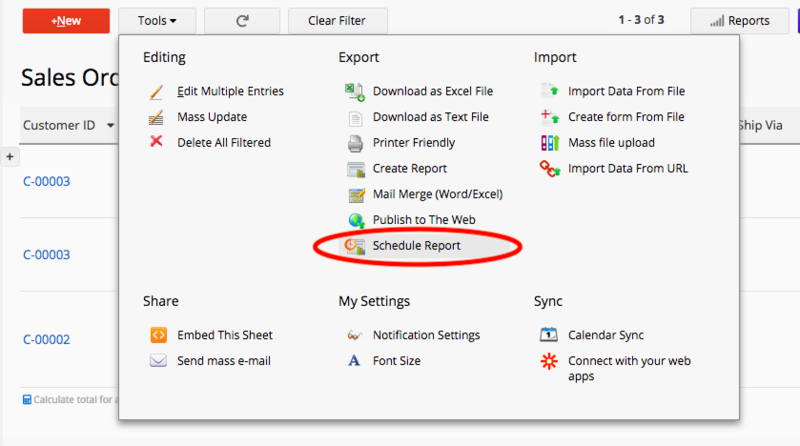 To schedule a report, go to Tools on the sheet’s listing page and choose Schedule Report under the Export section. A configuration window will pop up. You may choose to schedule a new report or modify a scheduled report. On the view selection, you may choose to schedule a report of records with saved Shared view applied, or no view to schedule a report of all the records in the sheet. All records compliant with the view criteria created at any time will be sent everyday. All records compliant with the view criteria created on the previous day will be sent everyday. All records compliant with the view criteria created on the previous week will be sent on Monday every week. All records compliant with the view criteria created in the previous month will be sent on the first day of every month. All records compliant with the view criteria created at the previous quarter will be sent on the first day of every quarter. All records compliant with the view criteria created in the previous year will be sent on January 1st every year. Name your file and enter the email address(es) you’d like to send the report to. Use the symbol “,” to separate multiple E-mail addresses, then click Save report, or Undo changes if you still need to modify the settings. You can schedule reports of up to 10,000 records in the sheet. Please note that when the number of records in the sheet exceeds 10,000 and the time interval is set to send “records of all time”, the system will only send the report of the first 10,000 records. Therefore, it is important to choose the time interval carefully. Please note that one schedule report rule (shared view + time interval) makes one report. 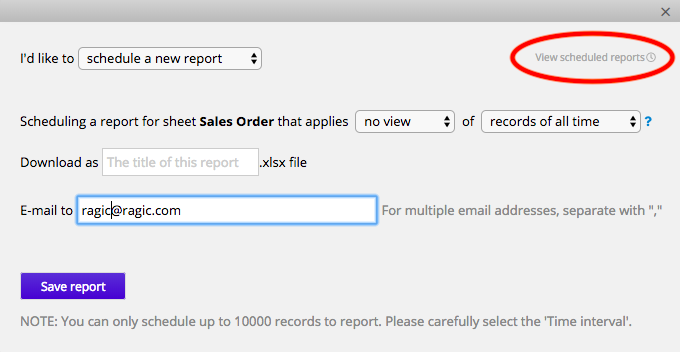 If different users need to schedule a sample report, select “modify a scheduled report” and add other E-mail recipients. To see all existing scheduled reports of the sheet, click View scheduled reports on the upper-right side of the pop-up window (this will take you to Job Schedule).